The Buyid dynasty or the Buyids (Persian: آل بویه‎ Āl-e Buye), also known as Buwaihids, Bowayhids, Buyahids, or Buyyids, was a Shia Iranian dynasty of Daylamite origin. Coupled with the rise of other Iranian dynasties in the region, the approximate century of Buyid rule represents the period in Iranian history sometimes called the 'Iranian Intermezzo' since, after the Muslim conquest of Persia, it was an interlude between the rule of the Abbasid Caliphate and the Seljuk Empire. As Daylamite Iranians, the Buyids consciously revived symbols and practices of Iran's Sasanian Empire. Beginning with 'Adud al-Dawla, they used the ancient Sasanian title Shahanshah (شاهنشاه), literally "king of kings". At its greatest extent, the Buyid dynasty encompassed territory of most of today's Iran, Iraq, Kuwait, and Syria, along with parts of Oman, the UAE, Turkey, Afghanistan and Pakistan. During the 10th and 11th centuries, just prior to the invasion of the Seljuq Turks, the Buyids were the most influential dynasty in the Middle East. Under king 'Adud al-Dawla, it became briefly the most powerful dynasty in the Middle East. The word Būya (Arabic Buwayh) is a Middle Persian name ending in the diminutive ـویه (Middle Persian -ōē, modern Persian -ūya, Arabic -uwayh). The Buyids were descendants of Panah-Khusrau, a Zoroastrian from Daylam. He had a son named Buya, who was a fisherman from Lahijan, and later left Zoroastrianism and converted to Islam. :274 Buya later had three sons, named Ahmad, 'Ali, and Hasan, who would later carve the Buyid kingdom together. Most historians agree that the Buyids were Daylamites. :251–52 The Buyids claimed royal lineage from Bahram V, 15th king of the Sasanian Empire. ^ C.E. Bosworth, The New Islamic Dynasties, (Columbia University Press, 1996), 154. ^ a b Fereshteh Davaran, Continuity in Iranian Identity: Resilience of a Cultural Heritage, (Routledge, 2010), 156. ^ Davaran, Fereshteh (2010-02-26). 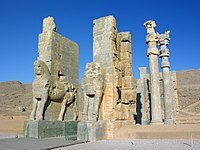 Continuity in Iranian Identity: Resilience of a Cultural Heritage. Routledge. p. 156. ISBN 9781134018314. Middle Persian was now replaced by new Persian as the popular language; and thus, the writings of historians , scientists and theologians of the Buyid court, which were in either Middle Persian or Arabic, were accessible to the vast majority of the Iranians only after translation"
^ Abbasids, B.Lewis, The Encyclopaedia of Islam, Vol. I, Ed. H.A.R.Gibb, J.H.Kramers, E. Levi-Provencal and J. Schacht, (Brill, 1986), 19. ^ Grousset, René (2002). The Empire of the Steppes: A History of Central Asia. trans. Naomi Walford. New Brunswick: Rutgers University Press. ISBN 978-0813506272. ^ Felix, Wolfgang; Madelung, Wilferd. "Deylamites". Encyclopaedia Iranica, VII/4. pp. 342–347. Retrieved 28 November 2016. The most successful actors in the Deylamite expansion were the Buyids. The ancestor of the house, Abū Šojāʿ Būya, was a fisherman from Līāhej, the later region of Lāhījān. ^ Blair, Sheila (1992). The Monumental Inscriptions From Early Islamic Iran and Transoxiana. Leiden: E.J. Brill. ISBN 978-90-04-09367-6. ^ Goldschmidt, Arthur (2002). A Concise History of the Middle East (7 ed.). Boulder, CO: Westview Press. p. 87. ISBN 978-0813338859. ^ a b Kabir, Mafizullah (1964). The Buwayhid Dynasty of Baghdad, 334/946–447/1055. Calcutta: Iran Society. ^ Ch. Bürgel & R. Mottahedeh 1988, pp. 265–269. ^ Felix, Wolfgang; Madelung, Wilferd. "Deylamites". Encyclopaedia Iranica, VII/4. pp. 342–347. Retrieved 28 November 2016. ^ a b Busse, Heribert (1975). "Iran Under the Buyids". In Frye, Richard N. (ed.). The Cambridge History of Iran, Vol. 4: From the Arab Invasion to the Saljuqs. London: Cambridge University Press. ISBN 9780521200936. ^ Bosworth, Clifford Edmund (1996). The New Islamic Dynasties: A Chronological and Genealogical Manual. New York: Columbia University Press. pp. 154–155. ISBN 978-0231107143. ^ Houtsma, Martijn Theodoor, ed. (1993). E.J. Brill's First Encyclopaedia of Islam, 1913–1936 (Reprint ed.). Leiden: E.J. Brill. ISBN 978-9004097964. ^ Karsh, Efraim (2007). Islamic Imperialism: A History. New Haven: Yale University. ISBN 978-0-300-12263-3. ^ Alram, Michael. "The Cultural Impact of Sasanian Persia along the Silk Road – Aspects of Continuity". E-Sasanika. 14: 10. The article uses Wahram Gūr for the king's name. ^ a b Nagel 1990, p. 578–586. ^ Kennedy 2004, p. 211. ^ Kennedy 2004, p. 212. ^ Bosworth 1975, p. 255. ^ a b Kennedy 2004, p. 213. ^ Bosworth 1975, p. 257. ^ Bosworth 1975, p. 256. ^ Kennedy 2004, p. 234. ^ a b Bosworth 1975, p. 289. ^ Bosworth 1975, p. 290. ^ C.E. Bosworth, The Ghaznavids 994-1040, (Edinburgh University Press, 1963), 53,59,234. ^ C.E. Bosworth, The Ghaznavids 994-1040, 53,59,234. ^ The Political and Dynastic History of the Iranian World (A.D. 1000-1217), C.E. Bosworth, Cambridge History of Iran, Vol. V, ed. J. A. Boyle, (Cambridge University Press, 1968), 37. ^ Bernard Lewis, The Middle East: A Brief History of the Last 2,000 Years, (New York: Scribner, 1995) p. 89. ^ Bosworth 1975, p. 251. ^ Sohar and the Daylamī interlude (356–443/967–1051), Valeria Fiorani Piacentini, Proceedings of the Seminar for Arabian Studies, Vol. 35, Papers from the thirty-eighth meeting of the Seminar for Arabian Studies held in London, 22–24 July 2004 (2005), 196. ^ Bosworth 1975, p. 287. ^ Kennedy 2004, p. 244. ^ Sourdel-Thomine, J. "Buwayhids." The Encyclopedia of Islam, Volume I. New Ed. Leiden: E. J. Brill, 1960. p. 1353. ^ Bosworth 1975, p. 252. ^ Abbasids, Bernard Lewis, The Encyclopaedia of Islam, Vol. I, ed. H. A. R. Gibb, J. H. Kramers, E. Levi-Provencal, J. Schacht, (E.J. Brill, 1986), 19. Bosworth, C. E. (1975). "Iran under the Buyids". In Frye, R. N. (ed.). The Cambridge History of Iran, Volume 4: From the Arab Invasion to the Saljuqs. Cambridge: Cambridge University Press. pp. 250–305. ISBN 978-0-521-20093-6. Taylor &, Francis (2006). Medieval Islamic Civilization: A-K, index. ISBN 9780415966917. Retrieved 2 February 2014. Patrick Clawson &, Michael Rubin (2005). Eternal Iran: Continuity and Chaos. ISBN 978-1-4039-6276-8. Retrieved 3 February 2014.